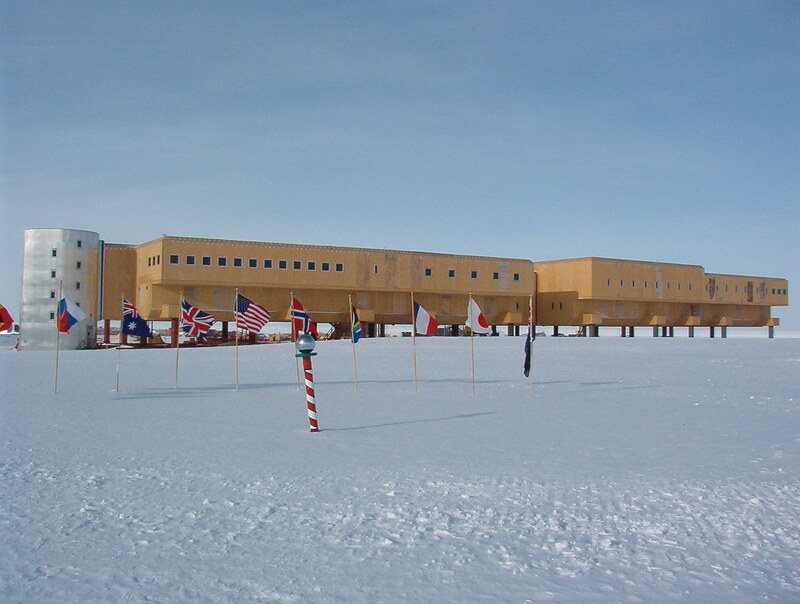 The New Power Plant (NPP) at the Amundsen-Scott South Pole Station was part of a phased 10-year construction redevelopment effort for the National Science Foundation (NSF). PDC joined the project in early conceptual design efforts which defined solutions for long term 25-40 year power plant, fuel, communications and grounding challenges This project demonstrates PDC’s specialized experience with multi-disciplined coordination and design of technically complex projects using PDC expertise with the design and construction administration of the diesel electric generating power plant in extreme cold regions where replacement components could be over 10-months away. The climate demanded the design of this 7,000-sf facility pay close attention to energy efficiency (fuel costs are approximately $12-per-gallon), and installation techniques to accommodate the extreme climatic conditions. With winter design temperatures that can reach -120 degrees F at a barometric altitude of 12,000 feet these considerations were paramount. Personnel safety (i.e., ventilation, exhaust, fire detection, fire suppression, and heating) were also considerations that needed innovative solutions due to the climatic conditions at the station. 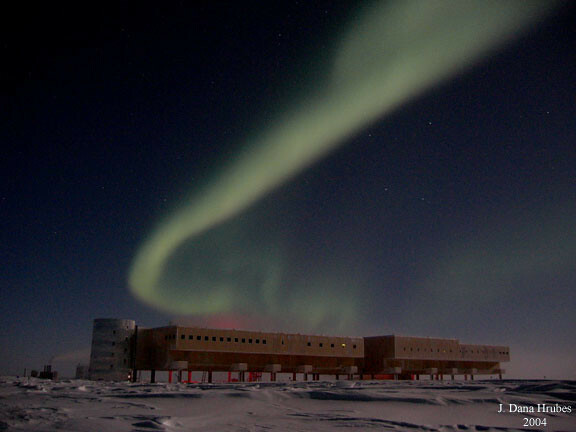 Prime and Peaking Generators are the heart of the South Pole Station meeting all of the facilities non-construction power needs. 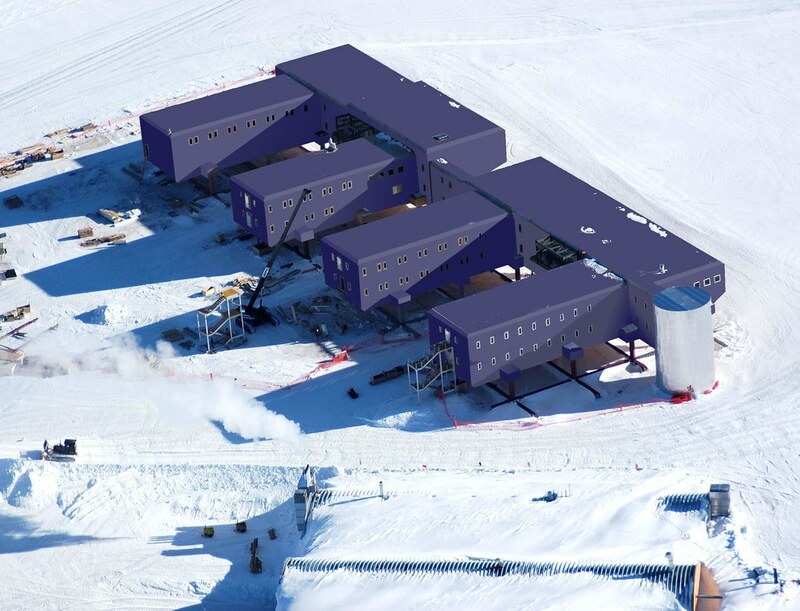 Each of three 1 MW prime generators, derated for altitude and AN-8 (an arctic jet fuel mixture) can provide 750 kVA of base-load capacity. Each Caterpillar generator includes a heat recovery package with a main jacket water heating system and is supplemented with an exhaust heat recovery silencers to provide heat for the entire Station. A 350 kVA 1800 RPM peaking generator was selected to meet the 1 MVA load of the Station. The same peaking generator is used in the stations emergency power plant within the above surface station. Fire Protection Design with detection, suppression and alarm systems included specially designed CO2 discharge and cross-zoned heat-detector-based releasing system to maximize the effectiveness of the suppression system and protection of adjacent generators. CO2 systems were utilized in the generator and internal fuel storage facility. The entire structure was protected through the fire detection and alarm with reporting provided for the station wide central fire reporting system monitoring. Water Treatment design for the Station was incorporated for the subsurface ice-pack water supply system, Rodriguez Well, produced water. The treatment area included two 3,000 gallon tanks, chlorination and testing systems. Fuel Storage of 2,000 gallons of AN-8 Jet/Diesel fuel, exceeding normal day-tank provisions had to be incorporated within the New Power Plant because ambient temperature for the station’s below surface fuel supply enters the facility at at 40ºF to -70ºF. In addition to maintaining the ambient temperature of the fuel tank’s room with unit heaters, the returning heated fuel from the engine generators is mixed with new fuel temperature to improve the efficiency of the generators. The Fuel storage room is internally diked and provided with CO2 fire protection systems. A lube oil purification system was included within the power plant to minimize transportation of spent oil back to the United States for disposal. 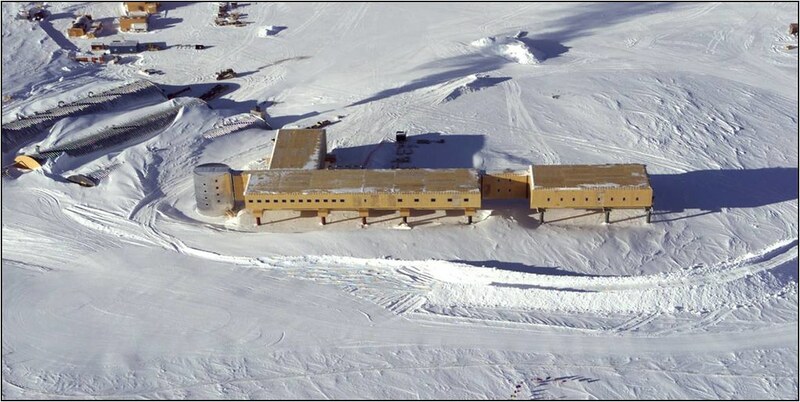 A Communications Hub for the subsurface station facilities from the above surface station and remote communications/satellite downlink were incorporated into the power plant facility. Cable tray distribution systems connected the other facilities were connected through thermal isolating penetrations of the facilities panelized exterior. Energy Recovery Efficiencies within the New Power Plant were incorporated. The waste heat from the engines in the power plant is being recovered for distribution throughout the station using multiple stages of heat recovery including jacket water and heat recover silencers. The heat recovered from the main power plant provides heat for the 65,000-sf above surface infrastructure and tunnel connected subsurface facilities. 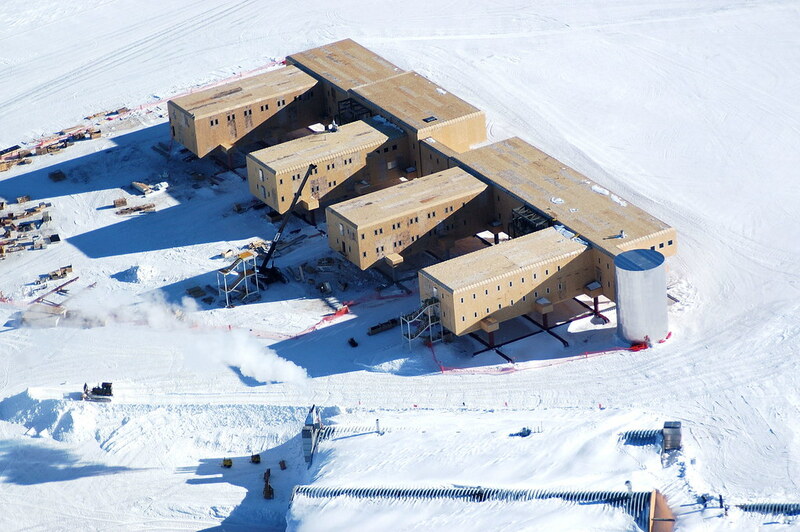 Heat recovery silencers were installed on the roof of the NPP with an ambient temperatures similar to northern alaska but below the snow surface. Commissioning of the above surface and other stations were conducted to maximize use of the waste heat loop’s capacity in lieu of backup fuel oil boilers. Primary Main Distribution Equipment was configured for redundant operations within and external to the power plant . This was critical to the design as the NPP is the primary source of power and heat for the Station and replacement systems could be many months away. Each outside distribution feeder can be fed from either the Primary Main Distribution Equipment (PMDE) or a nearly identical Redundant Main Distribution Equipment room located in a separate non-adjacent room within the facility connected in parallel to all feeders. To improve access for monitoring, the PMDE was provided within the main power plant office.